The Port Fairy Railway Goods Shed, located in the Railway Reserve between Regent Street and Bank Street, Port Fairy, was constructed under contract by Mr. W. Blackwood in 1890 during construction of the Warrnambool to Port Fairy railway. It is aligned at an angle reflecting the original line of the tracks. It complemented the Railway Station, demolished after the closure of the line in the 1970s when the entire railway infrastructure was also removed. The stationmaster's residence survives on a separate title. The goods shed is an example of astandard 20ft wide Victorian Railways late nineteenth century design designated N20, built of heavy timber framing, clad with unpainted corrugated iron on the walls. 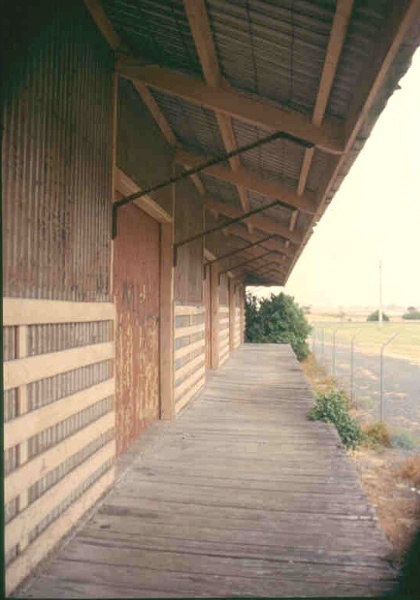 The original corrugated iron roof and stormwater drainage system was been replaced in the 1960s by unpainted corrugated asbestos cement sheets and plumbing. Timber trims and details are painted. Six large timber sliding doors along each side of the building provided easy access for loading and unloading goods. The platforms are sheltered by substantial overhanging eaves. 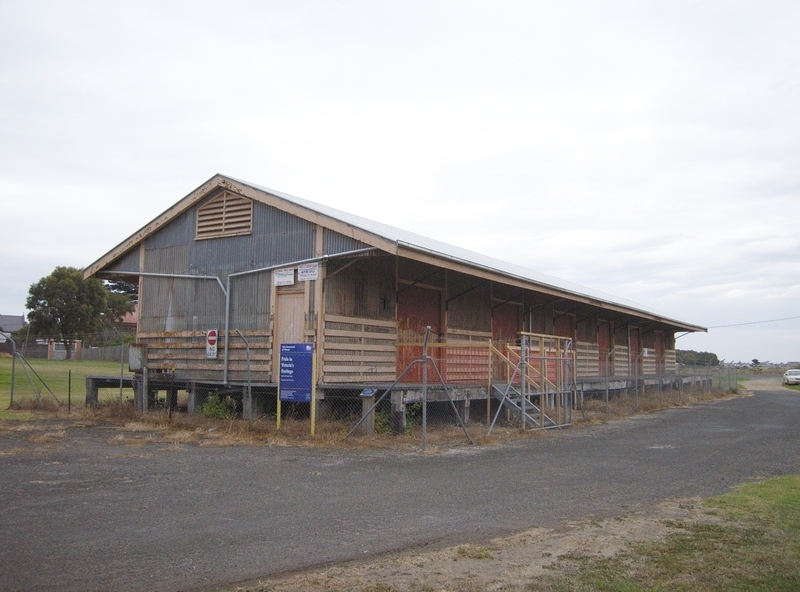 Apart from minor signalling some distance to the north, now on private land, and a storage shed located on the Port Fairy wharf, the Railway Goods Shed is only infrastructure remaining of the terminus of the Melbourne to Port Fairy line via Warrnambool and Koroit. In its day, the railway represented an important form of transport to and from Port Fairy, both for passengers and cargo. In the past, the shed was critical for the transport of local fish and wool. The building survives with an excellent degree of integrity and its condition is generally good but some localised parts of the fabric are in poor condition. The Port Fairy Railway Goods Shed is architecturally and historically significant to the State of Victoria. The Port Fairy Railway Goods Shed is of architectural significance as the largest, relatively unmodified surviving example of a Victorian Railways standard 20 ft wide, timber framed, corrugated iron clad goods shed of the N20 designation constructed throughout Victoria during the rapid expansion of the railway system between 1876 and 1907. It demonstrates the architectural high-point in corrugated galvanised iron sheds designed by the Victorian Railways; a design that balanced the need for an economical, functional building while retaining pleasant aesthetic qualities not found in subsequent designs. Having been built before the railway station, it is an example of a goods shed important in its own right rather than an adjunct to a railway station. The Port Fairy Railway Goods Shed is of historical significance as an example of the ambitious excesses of the Victorian Railways duirng the 1880s. Whilst it would seem to have failed in its objective as an economic link between the port and the hinterland, it represents the story of a fight for survival in the competition between railway and other forms of transport in the late nineteenth century. All the goods shed marked B1 on plan H2072 held by the Executive Director, and all the land marked L1 on plan H2072 held by the Executive Director. When railway construction in the colony boomed during the 1870s, a network of lines began to spread out to the south-west from Geelong and to the south-east and north-east from Melbourne. The Geelong to Winchelsea, Birregurra and Colac line was in operation by 1877, then followed the line to Camperdown in 1883, Terang in 1887, and Port Fairy (Belfast) in 1890. Agitation for a Belfast railway began in September 1871 when Cr Dr Scott pressed for a line between the port and Hamilton, via Macarthur. This enterprising idea projected Belfast as a potential mercantile marine hub for the district's produce, a development that would have necessitated the transformation of the port into a harbour. The Railways were favourable to the proposal, and the town. Then Warrnambool intervened, urging that the Hamilton line run from Warrnambool, via Koroit, with Koroit and Belfast served by a mere branch line. The first line was to run from Hamilton to Portland, with the Governor Sir George Bowen turning the first sod in April 1876. In 1877 it was finally announced that the railway from Hamilton would run not via Macarthur to Belfast as originally planned, but through Penshurst, Hawkesdale and Koroit to Warrnambool. This was a blow to Scott's plan and to Belfast's future; Portland and Warrnambool would have their links to the north, but Belfast would remain isolated. A delegation to Melbourne was appointed to agitate against this, but it seemed the most that could be hoped for now was a branch line from Koroit. As goods trains would prefer the more direct line to Warrnambool, Belfast was destined to be overlooked as a commercial port. The Hamilton-Koroit line was to be a failure from the start. As hopes for a direct link with the north faded, people began to think that it would be a good idea to have a line from Belfast to Melbourne, but a deputation in October 1880 failed to secure any definite promise of a railway to the district. By 1885 the matter was back on the agenda. That year the Railway Commissioners came down to Belfast and possible places for a station were investigated in Campbell Street, Cox Street, Gipps Street and just over the bridge in Belfast East. The local council was set on the site of the old cricket ground, so that that rail line would swing round the town on the west, curve across the cricket ground and terminate at a station at the government wharves on the river instead of stopping at Rutledge's comer. Tenders for construction of the Port Fairy and Koroit Railway were accepted from contractors, Messrs Buscombe and Chappell, and on 8 December 1887, the ceremony for turning the first sod of the railway connecting the town with the metropolis was performed. 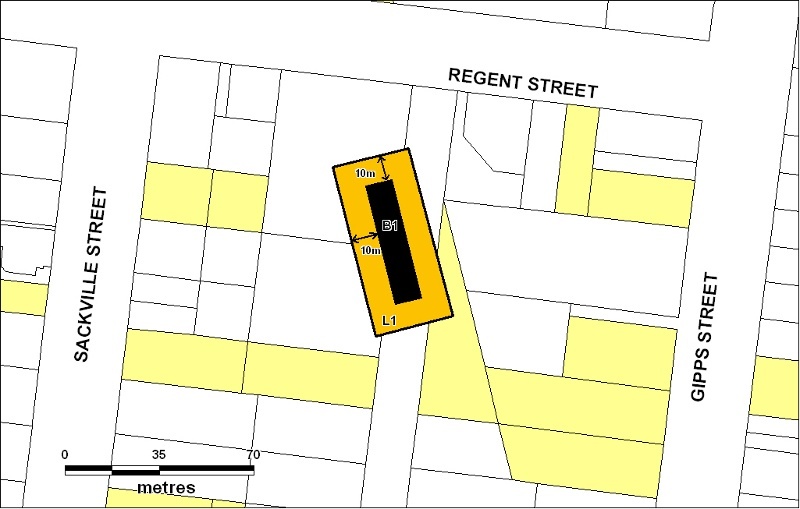 The site of this important spot was at the comer of Cox and Gipps Streets where the Rutledge and Co. store premises stood. On July 19, 1888, the first spike (specially gilded for the event) was driven in the first sleeper laid on the railway line to Koroit, with the Mayor performing the act, by request of the contractors. A big invitation banquet was held in Mr Holden's Victoria Hall, attended by 200 guests. The contractors had commenced the project at the Port Fairy end of the line because of the cheapness of landing at the wharves by the river all the material necessary for the construction. The largest sailing vessel that had ever entered the river Moyne, The Lord of Isles, brought railway timber, and the S.S. Hesketh and others brought rails. On 1 January 1889 the first journey was run on the new rail, with the Wesleyan Sabbath school kindly permitted to the use of the contractors' trucks and engine to convey the children to Mather's Hill for an outing. Other trips were made before the formal hand over to government. The first train from Melbourne arrived in Port Fairy on 12 November 1889 conveying the Railway Commissioners and a number of Department officials making an inspection of the new line before taking it over from the contractors, with the promise given that the line would be open before Christmas. But locals had to wait until 4 February 1890. That day the Koroit to Port Fairy line opened (11.05 miles), along with the segments, Warrnambool to Koroit (9.36 miles), Terang to Warrnambool (28.84 miles), and Terang to Mortlake (12.16 miles). The celebrations continued on 24 February 1890 when a children's' day marked the opening, and the biggest and most successful banquet in the town's history was held on the next day in the lecture hall with government Ministers, Mayors and Shire Presidents present among the 200 guests. Speeches at the function anticipated the arrival of the line to bring with it all the blessings and prosperity that it promised, but instead it became a Trojan Horse. Shipping companies floundered, and the river ceased to be effectively dredged, sealing its fate as a port for fishing boats and private pleasure-craft. The Nexus Between the Railway Terminus at Port Fairy and the Wharf. The railway connection from Warrnambool to Port Fairy always envisaged a continuation of the line from the station yard (between Regent and Bank Sts) through an easement to and over Cox St and Gipps St and then parallel to the Moyne to Queens Wharf (now King George Square). The object was to carry goods (wool, potatoes etc, to be loaded onto the coastal steamers and to collect cargo (particularly fish) for transport to Melbourne. Critical to this extension was access through the Belfast & Koroit Steam Navigation Co’s warehouse (which was built across the desired easement), north of the public wharf. This “through building” easement suited the shipping company, which could take in and store goods for shipment directly from the stationary wagons. A by-pass section and switching points was established on the wharf, to allow wagons to be left there for loading by fishermen before the wagons were connected to the afternoon train to Melbourne. (see VR Koroit & Belfast Line Easement plan). To allow the rail bypass to be located parallel to the wharf, the old Customs gauging shed (a PWD pillar and panel modular shed, with curved roof) was dismantled and re-located some 4-5 metres further west (away form the river). The declining inter-colonial trade had made this building superfluous for Customs use, and it seems to have been used by the fishermen, although no transfer of occupancy has been located. The fishermen used the building for storing nets, sails, boat gear and fish baskets. The building was never owned nor occupied by Victorian Railways; it was only linked to the wharf rail connection as it may have occasionally been used to store fishing items related to the forwarding of fish to market, or packed fish, if the wagons were not to hand, or loading in inclement weather. Detail of the carriage of fish to market by Victorian Railways is described in Evans Fins Scales and Sails, (2003). The rail spur also served the Port Fairy Preserving Company P/L, whose factory, built to the south of King George Square in 1896, canned fish and rabbit, although the canned product was usually shipped. The V.R. Commissioners started turning the economic screws, however, recognising the benefits to a monopoly of marginal pricing, and slowly strangled the shipping trade. Those places that had no alternative transport were paying higher prices for their freight than those where shipping provided competition. The Commissioners imposed a charge of 6d. per ton for all goods moved the half kilometre from the station to the wharf, thus discouraging transport by sea for inland consignors. Under local protest, a concessionary rate of 3d./ton for rabbits consigned to the preserving company was offered. Rail steadily captured much of the trade previously carried by sea. The river access required regular dredging, and the economic prospects for sea borne carriage of goods to/from Melbourne were declining. The B&KSN Coy. was placed in voluntary liquidation in 1940, and the disturbance of the rail line on the wharf in the 1946 flood sounded the death knell for the connection to the river. In time, the rest of the line would go, as the cost of infrastructure maintenance ultimately strangled the railway in 1979. Goods shed design and structural history. •Run-through goods sheds have a loading platform for railway vehicles inside the shed accessed by rail vehicles which can “run-through” the shed, entering at one end and leaving through the other. •Run-in goods sheds have a loading platform for railway vehicles inside the shed accessed by rail vehicles entering and leaving the shed from one end only. •Outside-loading goods sheds have the loading platforms for both rail and road vehicles outside the shed, rail on one side and road on the other. As the railway construction program gained momentum in the latter half of the 1870’s, the need to further reduce railway construction costs while retaining functionality became increasingly urgent. In 1876 a new design for an economical, highly functional goods shed was prepared. The new design, designated by Brook as the N20 type (Brook 2003), was essentially a timber framed, iron clad version of the ‘Avoca’ style brick goods shed (Ward & Associates 1988). Unlike earlier designs which were constructed in very limited numbers, usually less that ten, the N20 design became the standard constructed repeatedly throughout the state from about 1878, through the period of rapid railway expansion in the 1880’s, till about 1907. In common with the Avoca style, the N20 sheds were highly functional, purpose built goods sheds that featured a gable roof with the eaves extended over external loading platforms along both sides of the shed. With a width of 20 feet and a variable length based on 10 feet long modules, the N20 sheds ranged in length from 30 to 210 feet, with the majority of sheds 30 or 50 feet long (Appendices 2 and 3 and 4). Around 1907, the new, structurally simpler, standard 20 feet wide goods shed was designed that was more economical to build and maintain than the N20 shed, while still retaining essentially the same functionality. Designated the T20 design by Brook (2003), the redesigned shed was similar in general design to the N20 type, but was characterised by; (1) curved C.G.I. sheets over the apex of the roof instead of G.I. ridging; (2) simple timber struts supporting the verandahs instead of bent metal struts; (3) platforms and verandahs narrower than the N20 shed; and, (4) almost none of the timber frame was exposed to the weather and instead was covered by the C.G. iron, and the large timber framed doors were covered with C. G. I. and not timber sheeting. The main differences between the N20 and T20 goods sheds are illustrated in Appendix 1. From 1902 to 1928 at least 30 T20 goods sheds were constructed (VPRS 428/P, Units 1 to 12). Three excellent surviving examples of the T20 design are the magnificent 220 feet long shed at Hamilton, the 170ft long shed at Ararat, and the small well maintained 30ft shed at Talbot. 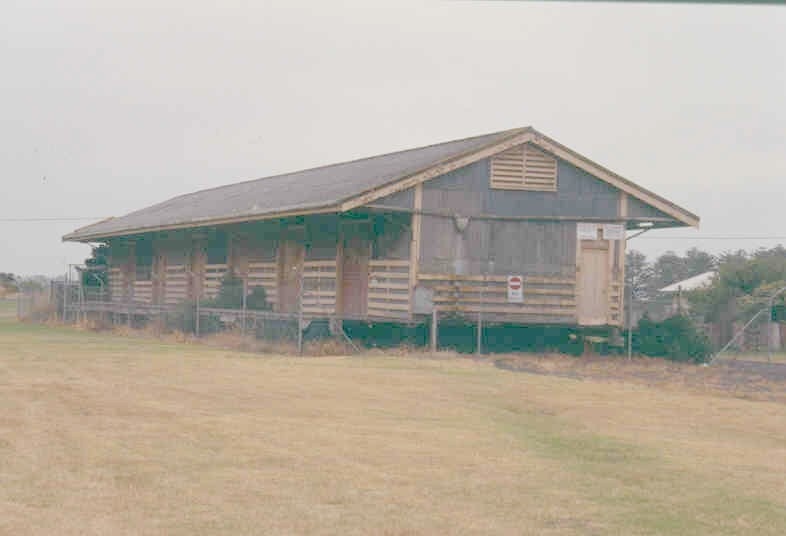 As most new railways were constructed after 1907 into less populated areas, particularly in north western and south eastern Victoria, two smaller and cheaper standard goods sheds with a width of 15ft and without verandahs were designed; a 30ft x 15ft shed and a 50ft x 15 ft shed. Apart from the lack of verandahs, the 15 ft wide sheds were essentially smaller versions of the T20 goods shed, with curved galvanised iron sheets over the apex of the roof, and corrugated galvanised iron sheets completely covering the timber frame and most of the exposed surface of the doors (VPRS 425/P, Unit 618, File 17/3024; VPRS 421/P, Unit 127, File 4947/15). Between 1910 and 1928 at least 28, 30ftx15ft goods sheds and three 50ftx15ft sheds were erected (VPRS 428/P, Units 1 to 12). During construction of the Warrnambool to Port Fairy railway, the Victorian Railways placed. an advertisement in the Port Fairy Gazette on November 8, 1889, inviting separate tenders for the erection of goods sheds and platforms at Warrnambool, Koroit and Port Fairy. The Port Fairy goods shed was erected by seven men between November 22, 1889, when Mr. W. Blackwood was announced as the successful tenderer for a price of £1150 (Port Fairy Gazette), and shortly after February 27, 1890, when the contract was almost complete and “only a few jobs remained to be done.” (VPRS 425, Unit 118, File 1737). The full 130 ft length of the shed was apparently constructed under the original contract, since the structural detail remains uniform along the full length of the shed and there are none of the usual indicators that the shed has been extended after construction. The original roof would have been clad in galvanised corrugated iron, with cast iron guttering and down pipes. Apparently they suffered severe corrosion caused by salt spray carried in the wind from the nearby sea, and were replaced at some time by corrugated asbestos cement sheets and storm water plumbing. The arrival of the railway was much anticipated and it did provide a quicker method of transporting fresh fish from Port Fairy to the metropolitan market, but it was never as important as an early north-south link might have been for the export of wool. The shipping link effectively ended in 1939. The railway was discontinued in the late 1970s due to an increased use of motor transport and the line now terminates at Warrnambool. The railway passenger station was demolished in the late 1970s. (A similar station survives at Koroit.). Passengers from Warrnambool now arrive by road coach at the new Visitor Information Centre at the south-east corner of the railway reserve which was designed to reflect the railway heritage of the site. Ward, A., 'Study of Historic Railway Buildings and Structures for V/Line', March 1988. Goods shed not identified. Society, 'Victoria's Railway Stations: An Architectural Survey', March 1982,4 vols. Goods shed not identified. Harrigan, Leo J., Victorian Railways to '62, Victorian Railways Public Relations and Betterment Board, Melbourne, 1962. Port Fairy line mentioned ~ but not buildings. Earle, William, (C. E. Sayers ed. ), Earle's Port Fairy: A History by William Earle, Olinda, 1973. Account of opening of the Port Fairy line, February 1890. Powling, J. W., Port Fairy: The First Fifty Years, Heinemann, Melbourne, 1980. Account of agitation for a Port Fairy line and opening in 1890. Evans, Stan, Fins Scales and Sails, the Story of Fishing at Port Fairy 1845-1945 (Jim Crow Press, Daylesford, 2003), pp. 221-2, 295-6, 379-80. Brook, Arthur J., Museum Technical Manual: Goods Sheds and Platforms of the Victorian Railways (Daylesford Spar Country Railway, 2003; in preparation). The purpose of the permit exemptions is to allow minor works that do not affect the cultural heritage significance to take place without the need for a permit. The building retains a high degree of integrity and is in fair to good condition although parts of the corrugated iron sheeting are badly corroded. The roofing material is non-original corrugated asbestos cement sheet, which is inappropriate and should be replaced with corrugated galvanised iron. Rain heads and down pipes also need replacing. These works should be subject to a permit.